Ramapo College has defined itself as unique since its origins in 1969. It is New Jersey’s liberal arts college and began as an interdisciplinary institution. The Salameno Spiritual Center follows in this tradition of innovation and inclusivity. 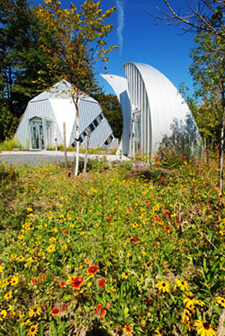 The Center is a complex of buildings, anchored by the Padovano Peace Pavilion and complemented with meditation buildings, a terrace, and a series of gardens on the shores of Kameron Pond. The Center began when a founder of the College and a distinguished professor of literature and philosophy, Dr. Anthony T. Padovano, envisioned a place of reflection and serenity for all people of good will, believers and humanists. Over a ten year period it took shape as donors affirmed the vision and paid for all the construction on this site. One of America’s lead architects put together an inspiring design, creatively weaving ancient symbols and contemporary aesthetics. The result is a Center that has attracted national and international attention. The Center is for the College Community although the general public is invited to reserve it for special occasions. The Center addresses those aspirations of the human heart which seek transcendent meaning in conventional religions or in the private conscience of the individual person. This Center welcomes all people to enrich its life with their presence. A College gives heed to the central concerns and needs of its community. It could not do this effectively if it neglected the spiritual condition and character of the human heart.